Diana Kerubo Mong’are felt compelled to take action after realizing, while playing with her younger brother, that the garbage piles in her community in Kenya were constantly increasing. She wanted more than to simply remove the trash from her neighbourhood. She decided to create a sustainable system to maintain her community clean and improve the environment. 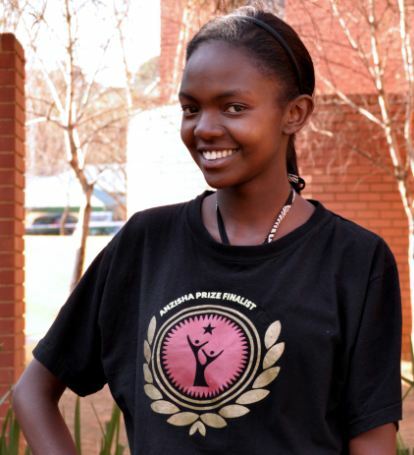 In February 2012, a few months after completing secondary school, the teenager informed her neighbours of her initiative, called the Green Planet Project, and gained their support, which was crucial in order to guarantee the success of her initiative. Diana then raised 10,000 Kenyan shillings to buy black and clear plastic bags and taught her neighbours to separate their trash into biodegradable waste and recyclables. The teenager also employed a person to gather the recyclables and negotiated their sale with a local recycling company, with the recycling proceeds being allocated to help fund regular waste collection in the community. Currently, Green Planet serves 50 households. Diana has subsequently launched a financially-sustainable system to collect sawdust from a local furniture factory and rotting vegetables from the market and sell them to chicken and vegetable farms. She is also striving to help these farms advertise sawdust as manure, in order to stop carpenters from burning sawdust. Moreover, the young entrepreneur has also supported the creation of environmental clubs in two primary schools, focused on teaching children community and environmental conservation methods. In 2012, Green Planet was selected as the first runner-up in the Anzisha Prize celebrating young African entrepreneurs and their innovations. She gained $20,000 to expand her project and become a leading environmental conservation and sustainability advocate in Africa.